This entry was posted on Wednesday, January 30th, 2008 at 9:48 am	and is filed under Bicycling, Friends. You can follow any responses to this entry through the RSS 2.0 feed. You can leave a response, or trackback from your own site. ugh–i bet standing out in that cold waiting was miserable. walt really goes in that early?! jeez…i had no idea. I was actually not too cold. Admittedly it’s warmer when you’re pedaling, but I have some really nice winter gear. Walt’s kind of an insomniac. He wakes up worrying about stuff and comes to the office. 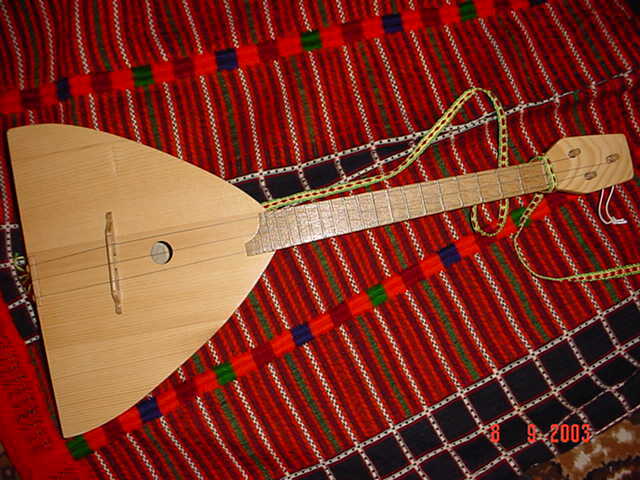 I was wondering why you carry a Russian folk guitar with you. Well, Travis, sometimes I’m just overcome with the urge to dance. Hooray for insomniacs! (In this case, anyway.) I am still fairly stunned by your level of preparedness. How do you get all that stowed? My pannier is fairly stuffed once it’s got my handbag, my lock, my lunch and a change of clothing in it… and I’m sorry to say I don’t carry any of the backups you do. I do appreciate your translation of the temperatures (although I can do miles). Were you actually riding in the gale-force winds? I would definitely not last even eight miles in the winds we’ve been having: it’s a mere 25mph this evening, and cycling felt more like sailing. Fortunately, it’s only three miles home. No, no, I drove yesterday. I knew the storm was coming, and besides, Tuesday is Choral Union rehearsal, and I don’t get out until 9 PM. I won’t ride home in the dark, so I always drive on Tuesdays. As for stowing it all, I have two panniers, and they’re fairly large. So it all fits easily. Besides, I was a Boy Scout. So I have to Be Prepared. As well as being trustworthyloyalhelpfulfriendlycourteouskindobedientcheerfulthriftybravecleandandreverent. According to my friend Pat, you left out two words. Of course, Pat had to be deeply closeted the whole time he worked for the BSA, so his tacking that on now could be seen as a form of post-BSA celebration. Thanks for the help, Pat. I have to say that scouting’s anti-gay stance in recent years has really marred my feelings toward the organization. When I was a kid, I suppose that they were anti-gay but never thought to mention it formally. Hell, when I was a kid what I knew about homosexuality came from those movies that they used to show in school assembly where they warned you to stay away from creepy older guys in fedoras who wanted to show you dirty postcards. I assure you, Pat does not now wear, nor has he ever worn, a fedora. As for the postcards, I’m not really in a position to know. I’m pretty sure when I was a Girl Guide, if I’d asked the leaders they’d have been merely anti-sexuality of any kind. But of course we never mentioned it. I’m a bit disturbed that the Scouting movement feels the need for a stance on such things. Paedophilia, maybe, given scoutmasters’ reputations in Britain. I merely have to do my best to do my duty to God*, serve the Queen, help other people and obey the Guide Law. (Which involved things like “making good use of my time”.) Not such hard work as yours. Though I think it was assumed we’d be fairly clean. *That line became optional towards the end of my stint. Anad apparently, Guides now optionally love God instead of doing their duty. Standards are slipping! Ah, what we would have done for some Girl Guidance back when I was a Boy Scout. Just to be clear — the Boy Scouts are the homophobes; the Girl Scouts are a separate organization with no such bigotry issues.